Goffin's cockatoos can learn how to make and use wooden tools from each other, a new study has found. Goffin's cockatoo (Cacatua goffini) is a curious species of Indonesian parrot not known to use tools in the wild. 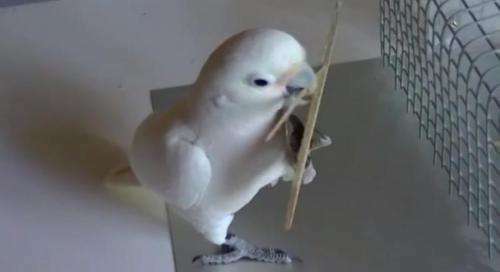 At a laboratory in Austria the researchers had observed a captive adult male Goffin's cockatoo named 'Figaro' spontaneously start to sculpt stick tools out of wooden aviary beams to use them for raking in nuts out of his reach. To investigate if such individual invention could be passed on to other cockatoos the team used Figaro as a 'role model', exposing other birds to tool use demonstrations, some with Figaro as 'teacher' and others without his 'students' seeing him at work. 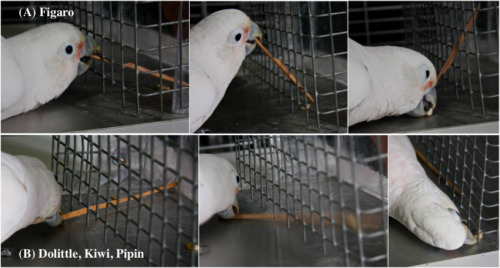 In the experiments one cockatoo group was allowed to observe Figaro skilfully employing a ready-made stick tool, while another could see what researchers called 'ghost demonstrations' – either seeing the tools displacing the nuts by themselves, while being controlled by magnets hidden under a table, or seeing the nuts moving towards Figaro without his intervention, again using magnets to displace the food. The birds were all then placed in front of an identical problem, with a ready-made tool lying on the ground nearby. Cockatoo tool manufacture featuring Figaro, Dolittle & Kiwi. Three males and three females that saw Figaro's complete demonstration interacted much more with potential tools and other components of the problem than those seeing ghost demos. They picked up sticks more than the ghost demo control groups and generally seemed more interested in achieving the result. Remarkably, all three males in this group acquired proficient tool use, while neither the females in the same group nor males and females in the ghost demo groups did. 'This is the first controlled evidence for the social transmission of an original tool use event in any bird so far,' says Stefan Weber, a student from the University of Vienna, who was involved in the data collection. The successful birds did not just imitate Figaro's movements: their tool-use techniques were themselves new. Figaro held tools by their tips, inserted them through the cage grid at different heights and raked the nuts towards him while adjusting the tool's position as the target moved closer. The successful observers, instead, laid the sticks on the ground and propelled the nuts into their reach by a quick ballistic flipping movement. The latter technique was arguably more efficient for the test circumstances, which differed from those in which Figaro had made his first discovery; the pupils in this sense surpassed the teacher's performance. 'This means that although watching Figaro was necessary for their success they did not imitate his exact motor activities. Successful observers seemed to attend to the result of Figaro's interaction with the tool but developed their own strategies for reaching the same result, rather than copying his actions. This is typical of what psychologists would call emulation learning,' explains Dr Alice Auersperg who led the study at the Goffin Lab at the University of Vienna. 'The importance of them needing an active live demonstrator is that they seem to be sensitive to 'agency' – the existence of a subject whose goal they share. This can act through paying more attention to the task, or some more demanding process such as empathising with the actor, but this is not known yet,' said co-author Professor Alex Kacelnik from Oxford University's Department of Zoology.